A check for over $500 was presented to Mark Mikel, Executive Director, Family Christian Development Center by Reverend Frank Ramirez, Lead Pastor, Union Center Church of the Brethren, Amber Burgess, Artistic Director, The Round Barn Theatre, and Richard Pletcher, CEO, Amish Acres. 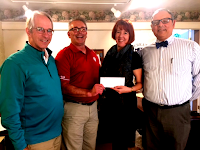 The money was raised by donations from audience members who attended the two staged readings of “Plain Paper…,” the new musical written by Mr. Ramirez and conceived by Mr. Pletcher with music and lyrics by Steve Engle. In addition to Ms. Burgess, the readings were directed by Katherine Barnes. Ten members of the theatre’s resident acting company donated their time to prepare for and present the new musical. “Plain Paper, Amish News That’s Print to Fit” is based on a fictional newspaper named the Vision. It is distributed nationally with newsworthy stories from Amish and Mennonite districts across the country. The news is supplied by scribes who keep track of the weather, births, deaths, weddings, illnesses and visitors over the previous week. Everything is running relatively smoothly until Winthrop Llewis shows up from Hollywood to film a reality show. Winthrop has his eyes opened in ways he never thought possible. The musical was presented last year my members of the Union Center Church of the Brethren. Ramirez and Engle, who have collaborated on additional musicals, continue to revise the script and music with the hope of staging a full production in 2018 as the theatre’s Second Stage Production. The Round Barn Theatre is Indiana’s only resident repertory theatre. It is the National Home of “Plain and Fancy,” the 1955 Broadway musical about Amish life and love. “Plain and Fancy” has been running for 32 years and is the second longest currently running musical in America. “Sister Act” is currently running in repertory with it. Tickets are available at the box office (800) 800-4942 or at AmishAcres.com. If you go to see “Sister Act,” now playing at the Round Barn Theatre at Amish Acres, because you want to see the movie “Sister Act,” upon which it is based, you’re going to be disappointed. No, scratch that. You’re going to be delighted because you’ll get exactly what you came for, only a whole lot more. The creators of this musical made the decision to keep the basic plot: a singer witnesses a murder and is sent to a convent for safekeeping until a mobster can be brought to trial. Both singer and sisters are changed for the better. What makes all these ingredients work for the Round Barn audience is Dee Selmore, who plays the aspiring singer Deloris Van Cartier. She is that rare performer who can both carry a show and challenge everyone in the cast to greater performances themselves. Selmore has some pretty big shoes to fill, considering the memorable actor who played her role in the movie, and she is up to the challenge. The company doubles up on various roles, but the champion is Round Barn regular Don Hart. I lost track of the number of roles he played, as he carved out fresh characterizations with each quick costume change. The writers have set the show in the 70s, an easy decade to lampoon because it had some of the worst fashions, worst music, and, thanks to the hilarious portrayal of the murderer’s henchmen, Martin Flowers, Travis Bird, and Justin Williams, the worst moves when it comes to dancing, dressing, and romancing. These three create characters who are legends in their own minds. Ryan Schlisler is the brooding, yet convivial villain. He casts a long shadow over the plot, allowing Dee Selmore’s light to shine all the brigher. Lauren Morgan transcends the versatility she’s brought to the several roles she’s played this season. As Sister Mary Martin-of-tours I simply did not recognize her, and wondered until intermission when I checked my program, what senior citizen they’d brought to play the wildly eccentric church choir pianist. In fact the women’s ensemble playing the nuns is wonderfully strong, funny, and musical. My favorite number in the show, “Raise Your Voice,” is buoyed by the epiphany experienced by the sisters as Deloris teaches them to sing together. The lyrics, based on many songs I remember from my years in parochial school, are wickedly tongue twistery, if I can coin a phrase, leaving one amazed and amused. Do not miss the musical “Sister Act” at the Round Barn Theatre. It is the highlight of the season so far. Frank Ramirez, Lead Pastor, Union Center Church of the Brethren, is The Round Barn Theatre's staff blogger. Of the top 20 Classic and Contemporary shows only two others have been in existence longer than Amish Acres, which will be celebrating its 56th year in 2018. The Kutztown Folk Festival in Kutztown, Pennsylvania celebrated 69 years this summer and Allentown’s Art Festival in Buffalo New York has reached the 60 year mark. Only Amish Acres show has been run as a business enterprise and integrated into an attraction by a single family. Many of the ranked shows are organized by promoters who rent indoor venues, mostly around the holidays. Of the thirty three honored shows in Illinois, Indiana, and Michigan only the Frankfort Illinois’ Chamber of Commerce’s Fall Festival that includes carnival rides ranks higher. The 2018 festival, which will be celebrating its 56th anniversary, will be held August 2 – 5. Early vendor applications are now being accepted. Contact: Becky Cappert of Amish Acres, (574) 773-4188 ext. 213, or BeckyMaust@amishacres.com.